With a focus on fitness, boxing teaches balance and hand-eye coordination while building confidence. 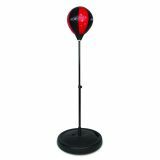 Weigh the base with water or sand, and use the pump to inflatable the spring-loaded punching bag. Height can be adjusted and junior boxing gloves are included. Ages 3+. 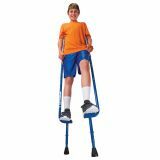 Rising to new heights on these performance-designed stilts! Adjustable height with rubber grips, foam shoulder rests and rubber walking tips.The welded footplates are durable as well as stable for various skill levels. Ages 4+, up to 220 lbs.